Recently, the Washington Post published the article “The best age to get married if you don’t want to get divorced”. Obviously, the best strategy to avoid divorce is to simply not get married at all. If you however prefer sticking to this centuries-old ritual, you may at least want to minimize the risk of divorce as a split-up’s side-effects such as emotional disorder and high financial costs are commonly perceived negatively. Nicholas H. Wolfinger’s (a sociologist at the University of Utah) findings help couples to identify an ideal age of permanently binding themselves to one another. His main advise is “Wait to get married but not too long.”. 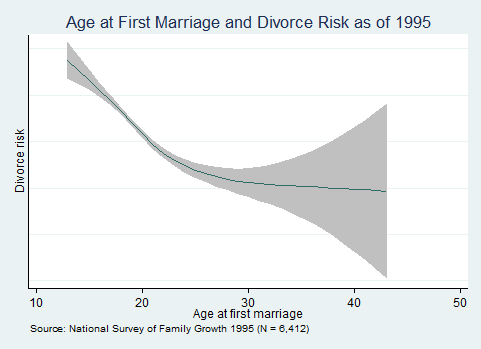 Postponing marriage until the mid-twenties sharply declined the divorce risk but also past this age the risk still decreased although at a lower rate. 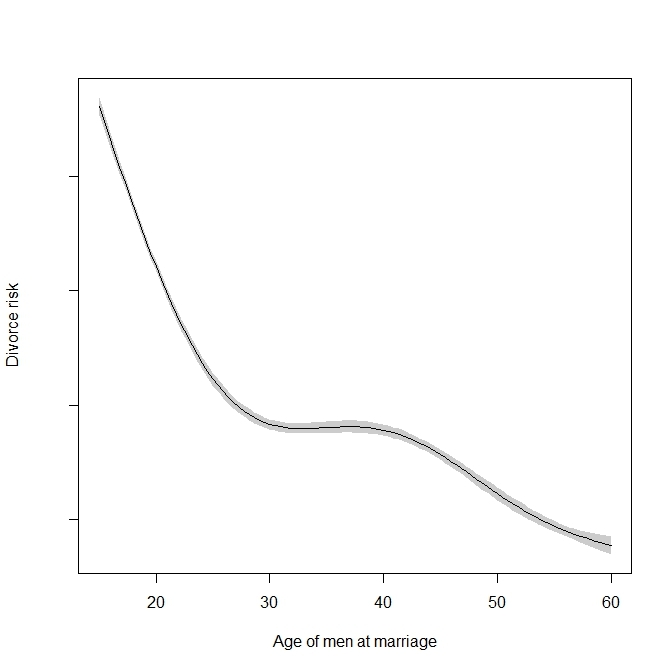 The analysis of recent data in contrast suggests that the negative relationship between age at marriage and divorce risk is not present any more throughout the entire life span. 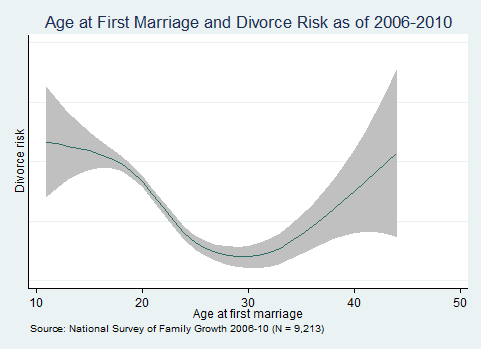 Whereas teen marriages are still highly risky, data shows a trend reversal thereafter. Wolfinger analyzed data collected between 2006 and 2010 and finds “that prior to age 32 or so, each additional year of age at marriage reduces the odds of divorce by 11 percent. However, after that the odds of divorce increase by 5 percent per year. 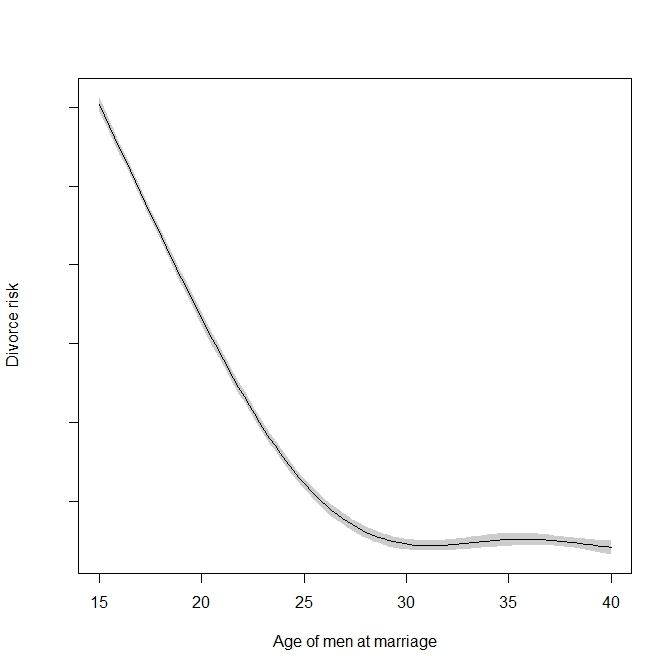 The change in slopes is statistically significant.” It seems that he detected an ideal age for marriage: somewhere around 30. Wolfinger uses generalized additive models (GAM) that permit non-linear, non-parametrically estimated functional forms in regression models and are therefore ideal candidates to find out more about the shape of dependent effects. I love playing around with data and I am a big fan of GAMs. So I decided to re-do Wolfinger’s calculations with data from my home country Austria. Although Wolfinger states the main class of statistical models he uses to perform this study, any kind of details are left out. Besides that, Statistics Austria does only provide highly aggregated data and prohibits certain data combinations that would be essential to perform such a kind of analysis. 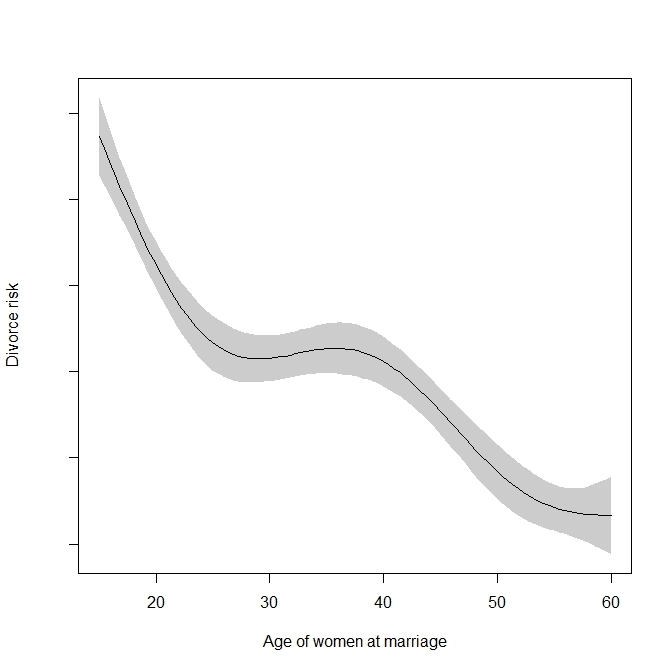 Still, I tried to use all the publicly available data together with a powerful collection of statistical tools to analyses the relationship between age at marriage and divorce risk in Austria for the year 2014. I had to rely on (at least for statisticians) highly unattractive things such as averaging, constancy assumptions, poor model performances and extrapolations. This is why details should be interpreted with care. Still, I am convinced that my methodology is able to measure the general tendencies in the relationship of interest. 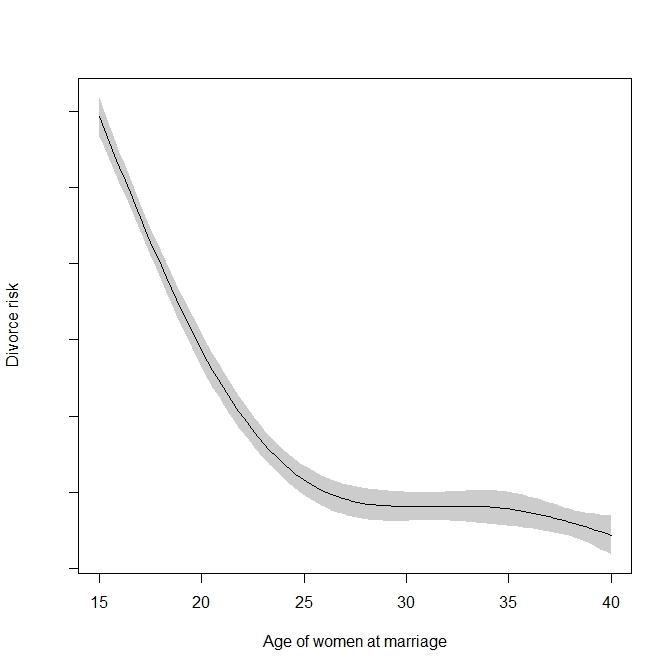 I performed the analysis separately for women and men as the usual age for getting married is still very distinct (men 32.4 and women 30.0 years). The figures below show the results. So, marrying around the age of 30 seems to be a good deal for Austrian couples that do not want to wait to get married until they reach their 50ths or 60ths. Couples tying the knot later in their lifes can expect a long/ever-lasting (hopefully happy) marriage. This entry was posted in English and tagged age at marriage, divorce risk, GAM. Bookmark the permalink. ← Charter Cities – The Solution to Poverty? This is a nice article — thank you, Sophie. And everything I write below is just meant for stimulating discussion. My response is going to be brief. Unfortunately, as an economist, I cannot comment on the statistical methods used for this analysis (or, probably if I do not know more about them, I cannot). So I would like to bring in another twist to this discussion. Is the risk of divorce a bad risk at all? Considering data from Statistik Austria, 16.647 ppl were divorced in the year 2014 — which they claim to amount to a divorce rate of 42.1%. Just considering this number, divorce seems to be a natural thing (these days) — otherwise ppl would not divorce to that degree. If it is accepted that divorce at one point in life is rather natural, why caring about the optimal point of marriage? I am aware that what I write is highly debatable. Well, I married at the optimal age. Seems I am an outlier regarding the statistical analysis. As time passes goals may change — and yes, divorce might become the better option at some point. But at this point in time, the optimization problem of finding the ideal moment to get married has already been solved. So it’s not of interest anymore. But as pointed out before, I think it is an interesting number to think about before choosing marriage. And no, you’re obviously no outlier: Minimizing risk is not the same as eliminating risk. This is probably a good time to publicize Gurgul’s Law – named after Prof. Henryk Gurgul who has been teaching this Law in various statistics courses at our fine University. The Law states that the optimal age of the wife is given by (age of the husband)/2 + 7. Your data seem to contradict this rule. What’s going on? Well, is this Goedl’s law then? In any case, it is most intriguing… . As pointed out this law must be outdated. Let me back this conjecture by some anecdotal evidence. There is a honorable businessman by the name of R. Lug. (83). His wife C.L (25) is younger than him. Let us assume first that this law is to be applied to men and women equally. Then, the appropriate age-range for a partner would be in [48, 152] for R.L. and in [19, 36] for C.L. An empty intersection, unfortunately, so Goedl’s law needs revision. Let us see if we can make more out of it. Suppose the law is considered more appropriate for men than for women. Consider f (44) and m (44). Then the law would suggest a partner for f around age 74, and a partner for m around 29. Hmmm lucky him — but it is not going to work that way, as f would not accept this. Well — unless f is C.L. (at the end, I believe that the Lug.-family will resolve all this mess). Thanks for your study. Good to know. Will tell my friends that married in their 20s. 1) Would not it be very easy for the Data Owner Statistic Austria (or you if they provide you data) to publish a more accurate study without doing fancy stats and without doing the ‘highly unattractive things’ you mention? If so, do you think it would be a good strategy in your next study to fight for better data access instead of struggling with statistical methods to deal with the inperfect data? Thank you, Christoph. You’re right: Better data access would indeed help avoiding unattractive methods whose sole purpose is to cope with these shortcomings. And yes, if it was my goal to perform a sound and comprehensive scientific study on this issue I would only rely on more appropriate, disaggregated data. But this analysis is not something to be published in a scientific journal but rather a pleasant weekend activity and nice statistical challenge: Given the restricted data, which methods can you think of to still get to an acceptable answer? Obviously, the more “fancy methods” used the less accurate is the result. As I understand this issue I included a “disclaimer” into my post – so that any data analyst knows how to interpret the results. If i I would have to make the analysis i would draw a nice Plot with the data and maybe draw a few Sketchy Lines and comments with a pencil. Probably the lazy way, i know.